Shangri-La. Just the name itself exudes grandeur and opulence. As one of the most luxurious and internationally acclaimed 5-star hotel in the world, the chain of Shangri-La Hotels can be found across Asia, the Middle East, North America, Oceania and Europe. A fact not know by many is that Shangri-La Hotel Singapore was actually the first to be opened by Shangri-La Hotel and Resorts back in 1971. Have you ever wondered how this posh-sounding name came about? I did. "Shangri-La is a fictional place described in the 1933 novel Lost Horizon by British author James Hilton. Hilton describes Shangri-La as a mystical, harmonious valley, gently guided from a lamasery, enclosed in the western end of the Kunlun Mountains. Shangri-La has become synonymous with any earthly paradise, and particularly a mythical Himalayan utopia – a permanently happy land, isolated from the outside world." Well, a permanently happy land sounds like a place that I would want to be with my kids. The thing is, I've always associated Shangri-La as a luxury hotel for the business travellers, the affluent or the upper class. It would definitely not be on the top of my list if I had to pick a family-friendly lodging for a staycation. So, it naturally thrilled me when I heard that Shangri-La Hotel Singapore recently launched a Family Stays for Free promotional package and best of all, we were invited to review it. Here's sharing our experience and just so you know, I'm giving away one package to a lucky reader so do read on till the end. The Family Stays for Free package is available for stays on Friday and Saturdays so the kids and I made our way there on Friday after school while the hubby joined us at night after work. Now, if you are like me, you will be thinking that a 2D1N stay sounds too short for a getaway and to lug three kids and luggages along might seem like a huge hassle. One big draw of this package is that you get to check out at 6pm the next day! This essentially means that you have nearly two whole days to enjoy the stay and that is good enough for us. Shangri-La Hotel Singapore is located along Orange Grove Road and while the nearest MRT station is Orchard, it can take you a good 15-20 minutes to walk over, especially if you have kids. Nonetheless, I like the fact that it is nestled in the heart of the city yet in an oasis tucked away from the hustle and bustle. Upon stepping into the lobby, you will be greeted by majestic crystal chandeliers hanging from the high ceiling, a grand sweeping staircase and extravagant marble glistening at your feet. If you wish to feel like a king or queen for a day, this might just be the place. The hotel consists of 747 elegant guestrooms and suites with three distinctive wings: the urban resort Garden Wing set amongst lush tropical foliage, the contemporary Tower Wing which houses the executive Horizon Club rooms, and the exclusive Valley Wing for the discerning traveller. For guests who wish to stay for an extended period of time, 127 serviced apartments and 55 luxurious condominium units are also available. Under the Family Stays for Free package, guests will stay in the Horizon Club Grand Premier Room located on levels 17 to 22 of the Tower Wing. 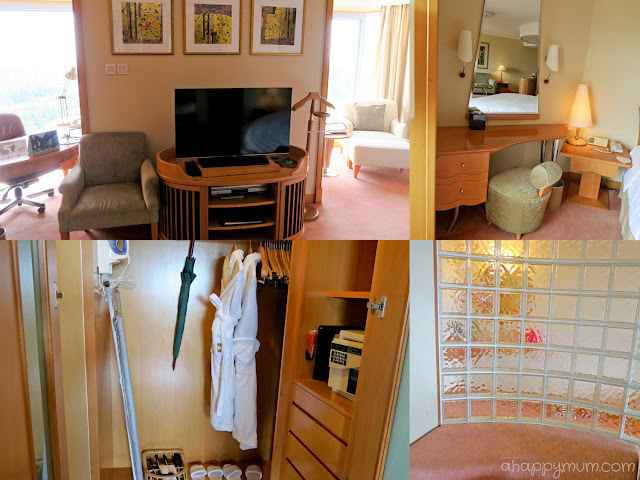 With an area of 72sqm, this room is as big as a three-room HDB flat and is definitely the largest hotel room we've stayed in so far. How huge is it? I'll take you on a tour! One of the largest executive level guest rooms available in Singapore, the Horizon Club Grand Premier Room comprises five distinct areas - lounge, breakfast area, a writing desk, sleeping quarters and a private dressing area that connects to a luxurious marbled bathroom. We were pleasantly surprised not just by the sheer size, but also the warm ambience and cosy feel of the room. An unique feature will be the two windowed alcoves which provide views of the surrounding skyline and ensure that ample natural light comes into the room. The L-shaped executive desk is perfect if you have some work to finish although my belief is that you should make use of a family staycation to relax and bond with your loved ones. Complimentary Wi-Fi and broadband access are provided. If you have a moment to spare, you can also make use of the comfortable armchair to read a magazine or novel. For me, I think it was a perfect spot to nurse my baby. There is also a seating area with sofa setting and coffee table that is ideal for breakfast, or supper if your kids sleep late like mine. Upon our arrival, we also received a plate of fresh fruits and a personalised welcome card. 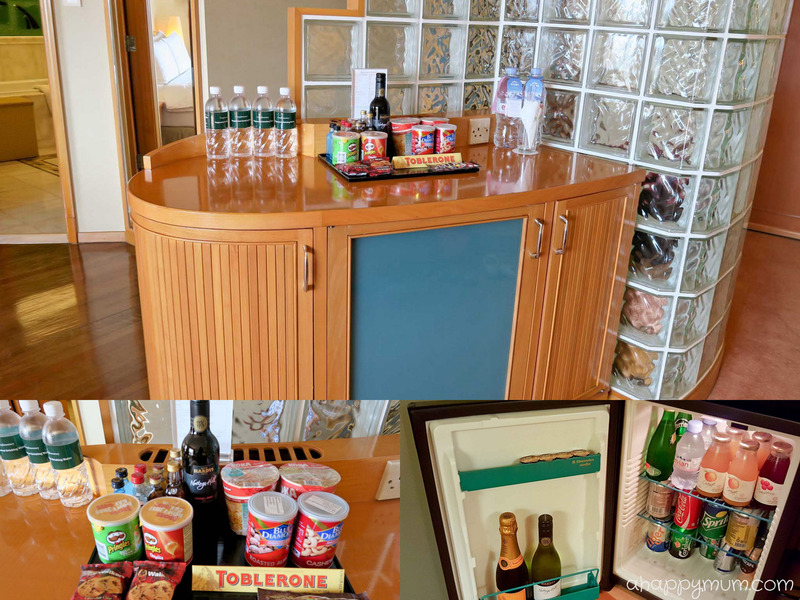 If you need a quick bite or are thirsty for a drink, the fully equipped minibar offers a range of beverages, chocolates and tidbits at a surcharge, except for the oxygenated water which is complimentary. If you like walk-in wardrobes, then you will be glad to know that the wardrobe has two big doors that open up to an abundance of space. What's more, there are even seats right outside so you can have your own private dressing area. How thoughtful! We were trying to look for the aircon control when we realised that it was included in the master control placed right beside the bed. It is an all-in-one control where you can set the alarm clock, adjust the aircon temperature, turn on/off the lights and open/close the curtains whenever you like. How convenient! One thing about the curtains is that they are double-layered so you can just close the sheer layer in the day to let daylight through and close the thick layer at night for total blockage of light. It worked so well for us that we slept till 9am the next day without realising that the sun was already up! 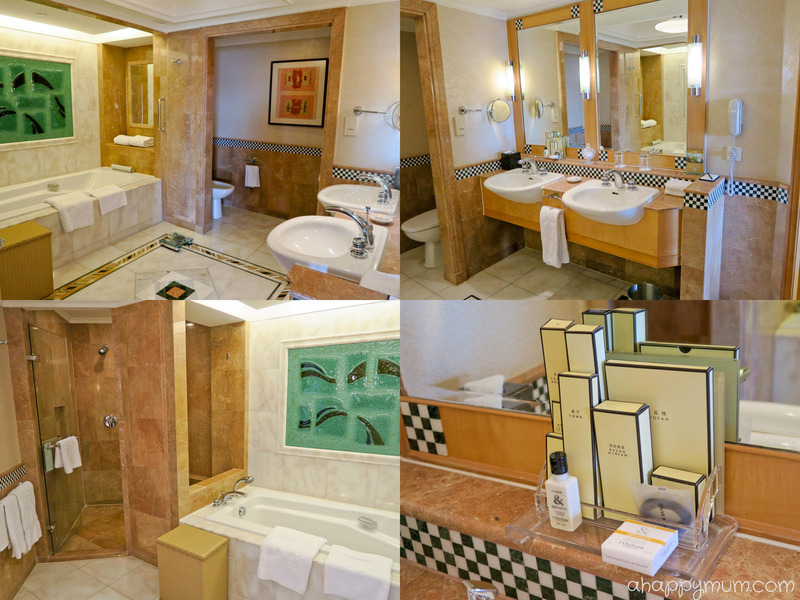 One of my favourite parts of the room has to be the marble-clad bathroom! It's easily the size of an average hotel room and features a bathtub and separate, glass-enclosed shower. This means that I can take a shower in the comfort of my own space while keeping an eye on the kids playing in the tub. There is also a basket to put in your laundry, a weighing scale and even a bidet that is separate from the toilet bowl. For the toiletries, besides a range of L'Occitane shampoo, lotion and shower gel provided, you also find the usuals like soap, comb, toothbrush and toothpaste, cotton pads, emery board and some special ones like a black hair tie, razor cream and even a loofah to scrub your body. 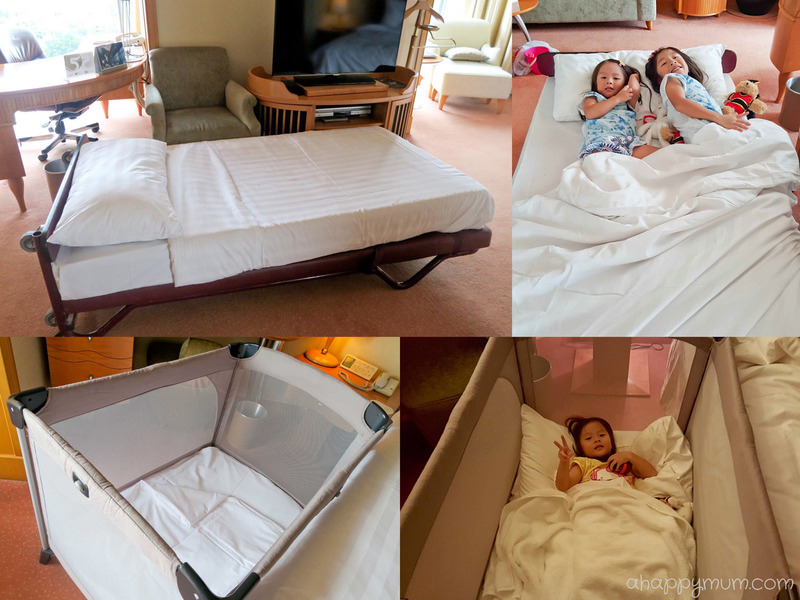 If you are bringing kids, you can also request for a rollaway bed or baby cot. We asked for both of these to be set up and yes, the room is still very spacious after that! One thing that could have been improved on in our case was that the beds were set up only after we had checked in, not prior. Also, we had to request for the kids' amenities which included bathrobes and slippers and these took quite a while to arrive at our door. After the kids were more or less settled down (I simply love this onesie on Asher which was a gift from a friend), it was time to explore more of the hotel! I like that the elevators were very prompt and efficient, plus the fitted carpet even tells you the day of the week, which kind of reminds us of our cruise on board Royal Caribbean. One of the best things about the Family Stays for Free package is that it includes Horizon Club privileges, with access to the exclusive Horizon Club Lounge on level 24. The Horizon Club is created exclusively for today's discerning business travellers and those who enjoy a higher standard of accommodation, personalized recognition, a host of special privileges and amenities. Club members get to enjoy beverages and food in the cosy comfort of the Horizon Club Lounge, complimentary broadband and wireless access, use of business centre facilities, meeting rooms and private workstations with Internet access, complimentary suit pressing service and daily international newspapers. The lounge is a perfect place to rest and relax, which might be something literally impossible when you have young kids with you. On our first day, I was there with the three kids and I swear all eyes were on us and we couldn't spot any other kid around. In any case, do make sure that the kids do not run around for safety reasons or create too much disturbance to other guests. For us, as crazy as it might be to be in a lounge with three lively kids, it was actually the first time we were having high tea together and I kind of enjoyed that feeling. So essentially, you can look forward to a staycation where you eat, drink, play, sleep, and eat and drink again! While we were delighted to snack on the finger food and canapés - which had a variety of offerings including sandwiches, smoked salmon, cookies, cakes, mousse, brownies, scones, dried fruits, fresh fruits etc - they might not suffice for a hearty meal especially if your kids need high-carb food. Nonetheless, we absolutely enjoyed our time at the lounge for both the afternoon tea and cocktail sessions. Oh, talking about that, you get to enjoy a free flow of alcoholic drinks from 5pm to 8pm too! In fact, you can even help yourself to the wine bottles and glasses which are displayed on the serving table. Wouldn't it be nice to chill out with your loved one in the comfort of the lounge over a bottle of Pinot Noir *reminisces the good old times*? If you are not an alcoholic lover, coffee, tea, canned drinks and juices are also available. One thing to note is that children below the age of 12 are allowed to enjoy the Horizon Club Lounge until 6:00pm only, which was the reason why my romantic date didn't happen as the hubby arrived after 6pm and I had to usher to kids out of the lounge already. In addition, smart attire is required when visiting the lounge and apparel such as sports attire, swimwear, bathrobes, slippers and flip flops are strictly not permitted. Moving on, we took a walk around the hotel to check out the rest of the facilities. Yes, we like to be on the go and are always keen to explore new places and discover new sights. Set amidst 15 acres of luxuriant greenery, the Garden Wing offers you tropical greenery and lush natural surroundings. On the morning of our second day of stay, we took a stroll in the landscaped gardens and the kids were delighted to come up close with flora and fauna, in particular they loved spotting the squirrels which did not seemed to be too afraid of us and stayed in close proximity for quite some time. 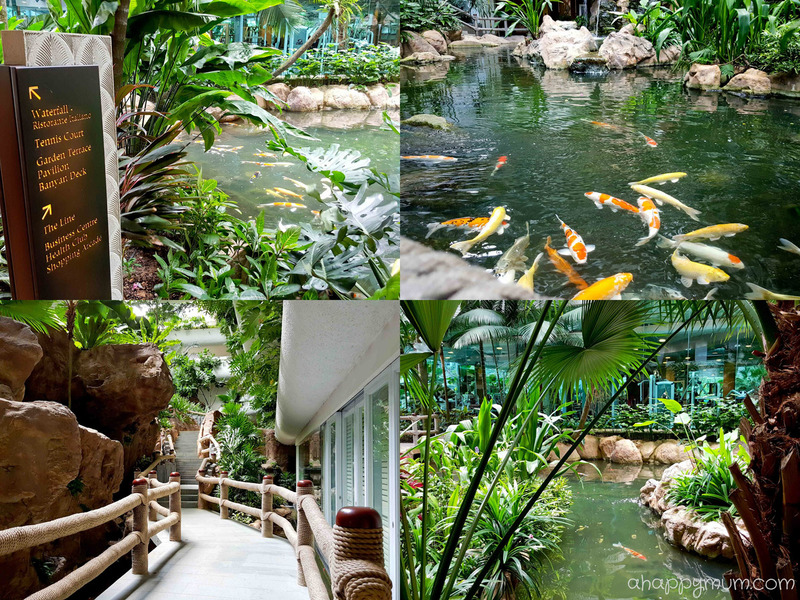 At the Garden Wing, there is also a small cascading waterfall and a koi pond which adds tranquility. In the evenings, the resident koi master conducts a koi feeding ceremony at the waterfall at 5:45p.m. For the tennis lovers, the hotel offers four flood-lit tennis courts, two with artificial grass and two with multi-weather surfacing. Tennis equipment can be obtained from the Fitness Centre. The Health Club offers a wide range of fully equipped fitness facilities and a 24-hour gymnasium. The male and female changing rooms each offer a sauna, steam room, Jacuzzi and relaxation areas for all guests and members. The Health Club is accessible to members and hotel guests who are aged 18 and above only, if you might have to take turns with your spouse while the other looks after the kids. The business centre, which is located in Horizon Club Lounge, offers a range of facilities and secretarial support, including copying, fax and courier services, video conferencing, translation and interpretation services. Meeting rooms and workstations are also available. 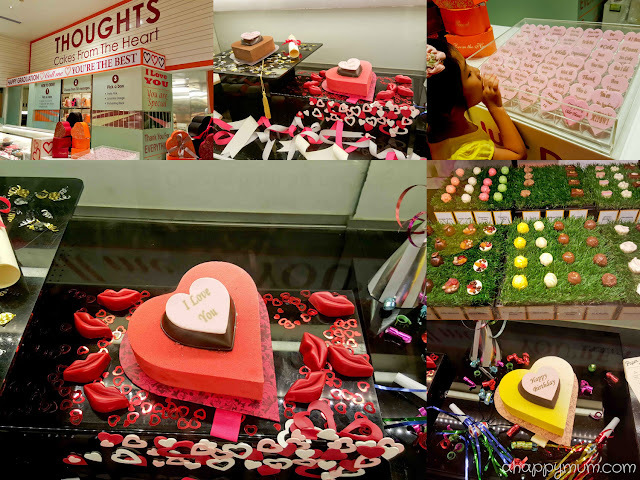 If you are feeling bored, and rich, then you can take a walk in the shopping arcade and go for a haircut, get your nails done, grab a souvenir or get a cake that comes with a personalised message. Lobby Court serves light snacks and a range of wines, liqueurs, cocktails and other beverages. You can enjoy a Shangri-La Sling, Shangri-La's refreshing award-winning cocktail. Live musical entertainment is also available from 7.30pm daily, except on Sundays. 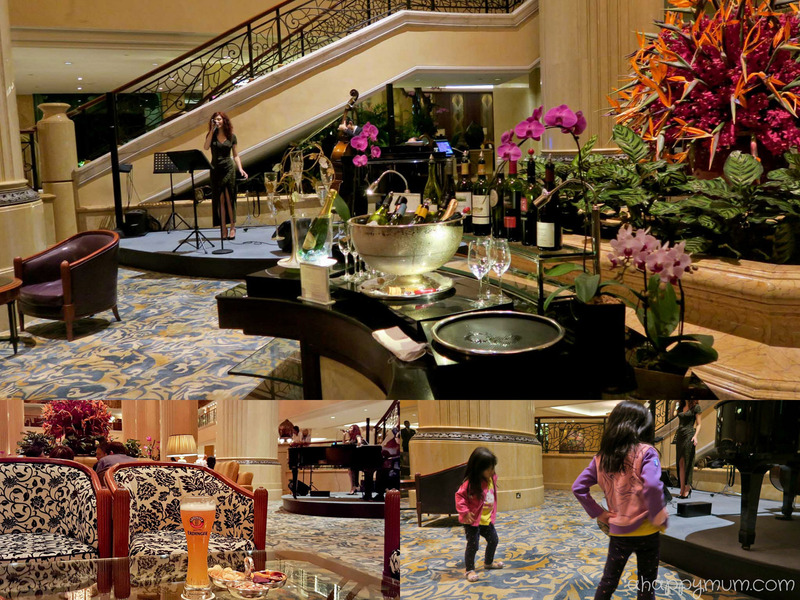 We returned to the hotel late on Friday night and the kids were so happy to hear the live music. Yes, you probably know how much they love dancing by now. So, we spent a good one hour that night just listening to the music, watching the kids dance, munching on tidbits while the hubby enjoyed his glass of Erdinger. The swimming pool consists of an outdoor swimming pool, children’s play pool, warm jacuzzi and fountains. While it is not as kid-friendly or as inviting as the one in Rasa Sentosa Resort and Spa, the kids still loved it and we made our way here not once but twice during our stay. We love the kids bathrobes and they come in pretty handy, plus Ariel love the slippers too, so do make sure these welcome amenities are in your room, otherwise you can request for them. I was glad that we brought along the water toys because the girls had a blast having pretend play in the fountain and entertained themselves by picking up fallen leaves and flowers around the garden for a good amount of time. As for me, I took the chance to rest and relax on the sun lounger with my little one while admiring the view and appreciating the simplicity of life. And you know what was the best part? It was when my big girl walked up to me with a flower in her hand saying "I am going to name this flower Mummy because it is especially for you, Mummy." Awww, the sweet joy of motherhood. Featuring a wide variety of international cuisine at 16 live theatre kitchens, The Line at Shangri-La Hotel is one of Singapore's favourite destinations for buffet meals. Breakfast buffet is served from 6:00am to 10:30am from Monday to Friday and 6:00am to 11:00am on Saturday, Sunday and Public Holidays. Since we were there on Saturday, it meant that we could all sleep in a little later and still get to enjoy the breakfast, which was something we appreciated. I have to say that we were quite impressed by the variety and quality of food there. 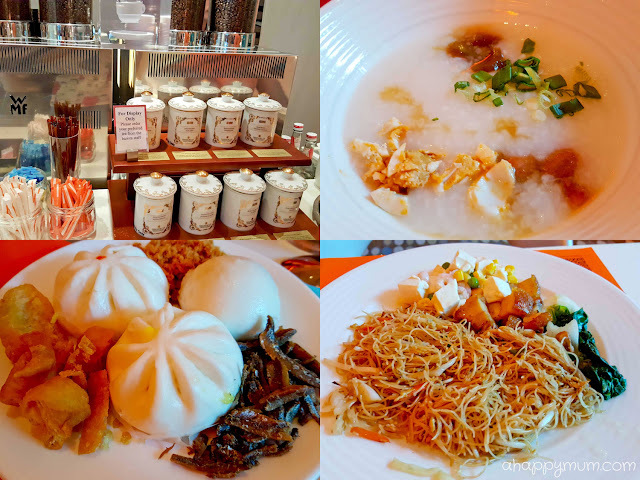 Western, Asian, Chinese, Japanese, Malay, Indian - you can get to choose from various types of delectable cuisine that you would like for a wholesome breakfast. In addition to the usual pancakes, waffles, bacon, sausages, cereal, fruits, yoghurt, ham, cheese and omelettes, the kids and I were elated to lay our hands on fishball and prawn noodle soup and we were also blown away by the many types of donuts available. 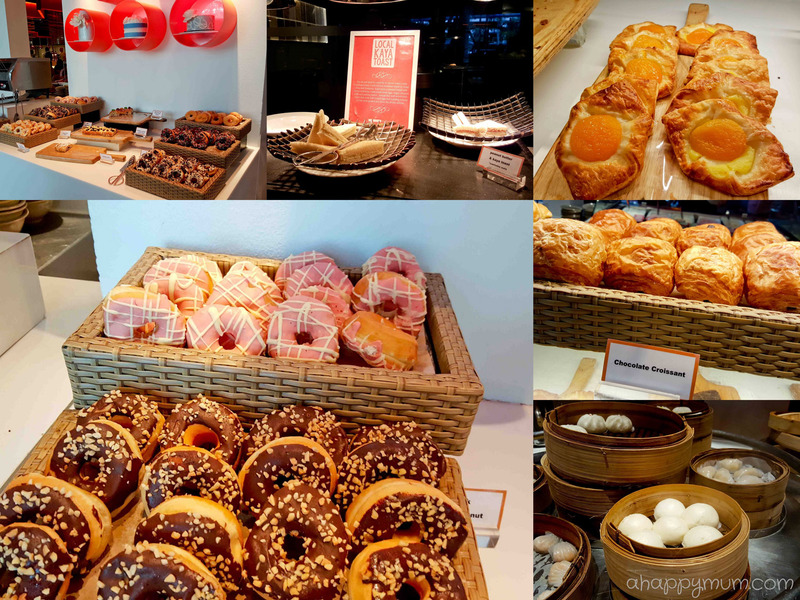 In addition, there were also many types of pastries, dim sum and even local styled kaya and peanut butter toast too. For those with young kids, you can also find congee here for the little ones with assorted condiments for your choice. There is even fish congee too! The hubby who likes oriental food was also happy to find fried bee hoon and some Chinese dishes like tofu and stir-fried vegetables (I can never eat these in the early morning). I was contented with just the buns though! We might not be food connoisseurs but we found the food to be yummy and I believe it won't disappoint you too. It was definitely a breakfast that we all enjoyed and we were thankful for a great start to our day. Located in the heart of the city, Shangri-La Hotel is just a short walk to Orchard Road, Singapore's main shopping, entertainment and dining district. I can't remember when was the last time we came here as a family since it gets really crowded during the weekends. Anyway, we were glad to take a walk down Orchard Road during our staycation and it was the baby's first visit there. From the hotel, you can easily walk or drive down along Orchard Road. There is also a complimentary hourly loop shuttle service that you can take in the day up till approximately 8:00pm. If you are a night owl, then you can also take a stroll at night to enjoy the night scenery, have supper or catch a late night movie too! I think that the Family Stays for Free package is a good initiative to let young families come together and enjoy a leisure weekend together. Even though the price might be considered a little steep, you get what you pay for and that includes luxury accommodation, good food, exquisite surroundings and club lounge privileges. All in all, it was a wonderful staycation for us and we were thankful to get the opportunity to relax, bond, chill and relish some good times as a family. Thank you, Shangri-La! Make time for your family by having a getaway in one of the Tower Wing's Horizon Grand Premier Rooms. 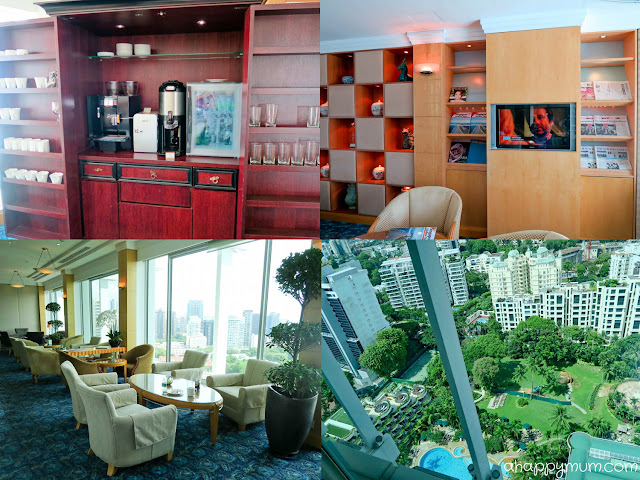 At 72 square metres, these rooms are some of the largest club level rooms in the city. Guests staying in these rooms will enjoy access to the exclusive Horizon Club Lounge. Get up to SGD150 in complimentary add-ons, including a roll-away bed and breakfast for everyone. From SGD505 per night, this offer is available from 28 Jan 2016 through 29 May 2016. - This offer is available for bookings made before 31 March 2016 for stays on Fridays and Saturdays before 29 May 2016 (excluding 16 to 18 February 2016). - Prior reservation is required and subject to availability. - Not valid in conjunction with other offers or promotions. - Price is subject to 10% service charge and government taxes, including GST. - Bookings can be made online here. Good things must share if you can! That is what I honestly believe in. So here's a giveaway for those of you who are keen to win a staycation at the luxurious Shangri-La Hotel with your family too! To participate, leave your name and email address in this blog post and tell me which activity you are most looking forward to at Shangri-La Hotel. Indicate in the Rafflecopter widget that you have done so and to increase your chances of winning, you can carry out the rest of the options. Good luck! Disclosure: We received a media invite by Shangri-La Hotel to review the Family Stays for Free package and enjoyed a complimentary 2D1N stay. All pictures and opinions are ours. It's a MUST to visit the SWIMMING POOL when on staycation ! I'm most looking forward to that ! Would love to win this stay for my daughter's 5th birthday! She will love the big pool and huge room to roll about with her brother. She loves staycation!Looking forward to also eating out at the delicious looking high tea buffet with hubby to celebrate our 6th anniversary! Thank you! My kids love to explore the pools the first thing after check in! Big or small, they simply love them all! I am so looking forward to the Swimming pool!!! Can't wait to go for a swim and relax in the pool!! We would be looking forward to all the lovely activities you mentioned! Especially so for the pool, nature walk and of course the dining experience at The Line. Bonding with the family is precious and priceless. Hope to win this staycation package for my two lovely girls and hubby as we have not travel for years. Thankful for the chance. Thanks for organizing and the great review despite having to juggle with three kids! You are not just "a happy mum" , an awesome mum too. The last time I visited the Line was when it was just the 2 of us.. hope to win this to visit it again as a family of 4 now :) excited to enjoy the big pool with my 2 kiddos as well! I hope to win this for my well deserved "trip" after my #3. 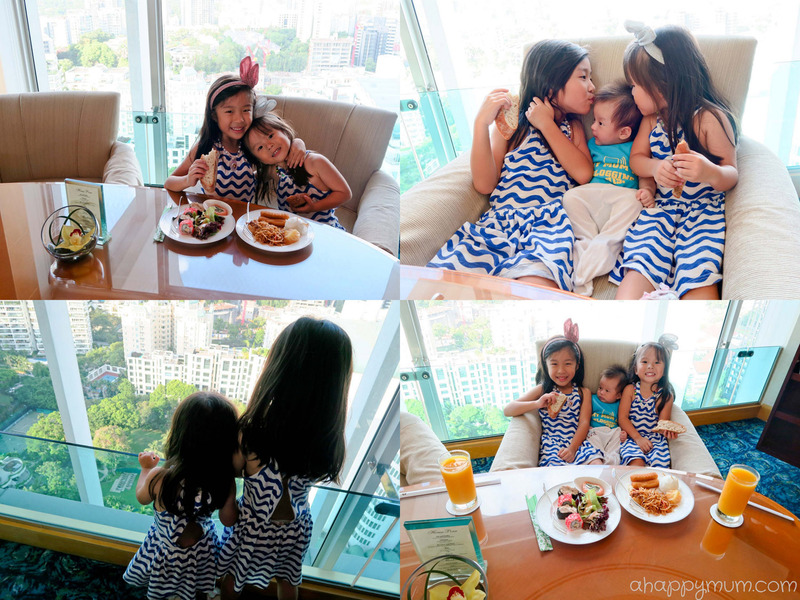 My 3 girls will be thrilled if they can have a staycation at Shangri-La. We love staycation! Most looking forward to spending quality family time in the huge hotel room and relaxing by the pool side. ❤ the landscaped garden, waterfall and the koi pond!It really lets us immerse in the beauty of nature and temporary let go of ourselves and enjoy the beauty! Hope to win this lovely giveaway so that my family can enjoy quality bonding time! I will be looking forward to the Swimming pool! The kids can have fun at their fountain and I can relax in the pool! Jiejie will love to explore in the Landscaped Garden and meimei will love to sitby the waterfall and Koi pond. Looking forward to the bonding time at swimming pool. My kids love swimming! 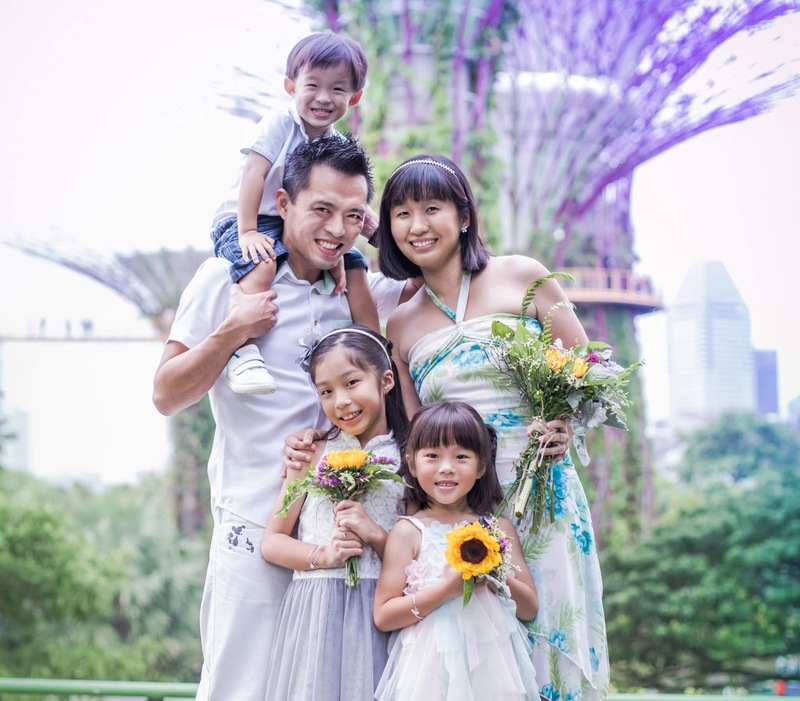 We never had any staycation in Singapore before and really hope to win this for my family. It will definitely be a great binding time with hubby n our 3 girls. Thanks for the chance ! Hoping to spend time with my family! Looking forward to have a catch up with them soon after so long of not having a break from work! We are looking forward to pigging out at the lounge and Swimming in the pool. Looking forward to the family time n bonding time with my kids in the swimming pool. My kids love swimming. I know they will be very excited to swim at the swimming pool. They will love the outdoor swimming pool, children's play pool and pretend to be a little adult and dip inside the warm Jacuzzi ! I think everyone will have a super great time there. Best place for family staycation. My girl would love the pool, my Husband and myself would love to indulge ourselves in food and wine and it would be a treat to my Mother in law too.. Thanks so much for the lovely giveaway. I definitely am looking forward to the Landscaped gardens. Greenery calms and feeds my soul. Stress have built a home in my body in the last few weeks and it has been really exhauting! Looking at your pictures already make me relax, can't imagine the real thing! Relaxing with my family is my ultimate dream! I hope to get recharge soon! Sharngi-la happiest place on earth! Been following your posts in facebook and blogs all these while. Worthwhile for reading! nice! Its the birthday month of my 2 little precious and hope this is a surprise for them! Definitely looking forward to the huge swimming pool for them to have fun! Not forgetting the greenery, good service that the hotel will provide (can see from your post. :) ). Looking forward to it! Swimming, my girl love it a lot! Hope to bring her there to enjoy the pool facilities! My 3 kids, 5, 3, & 9mo would love to explore everything especially the swimming pool! Sweet treats is all time favourite for the toddlers and a morning garden walk enriches their knowledge about the nature. My #2 3rd birthday falls on 27 May, #3 1st birthday falls on 04 June, hope can win this and give them the most memorable birthday treats! And a long waited relaxation for me & hubby. I'm definitely looking forward to the non stop feasting on the buffet, afternoon tea, cocktails and canapes! Totally relaxing and enjoying! The swimming pool of course so that I can play at the pool and fountain as well as relax in the warm jacuzzi. We'll be looking forward to the large comfortable room and the Horizon Club Lounge that made us feel pampered. Not forgetting the bathtub! Bubble bath for the kids, how cool is that?!? 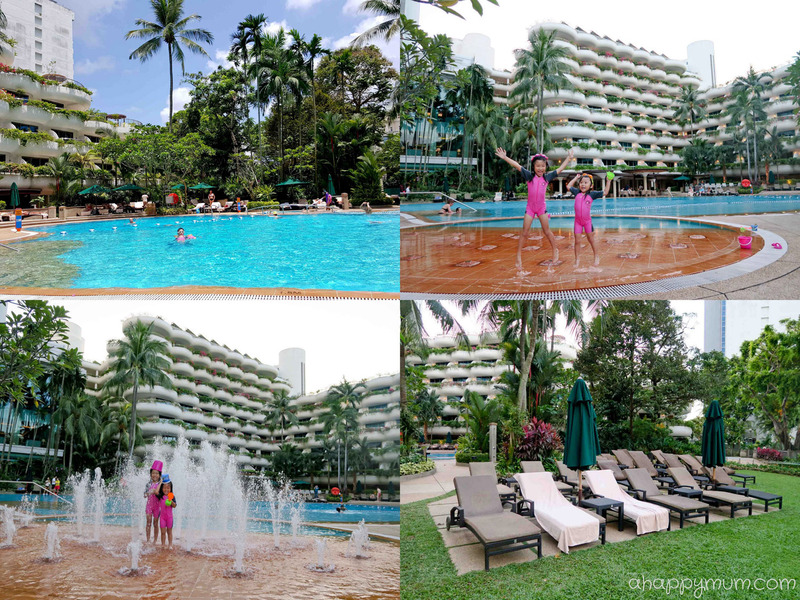 My kids would love to explore the pool!and they love staycation. Hope can win this so that i can gif my gal a surprise birthday staycation on her birthday in may. We would love to go be at the Lobby Court with wines, snacks and live music! Best of both world as Hubby and I can enjoy ourselves with a couple of wine while the kids enjoy the snacks. All of us can enjoy the live music together! I am mother of 3, children aged 11, 10 & 4. 2nd & 3rd child birthday is round the corner, it will be the best surprise gift for them if I will be able to bring them to this awesome staycation. I looking forward to bring my kids to the swimming pool as they love to swim & play in the pool. not forgetting to pamper myself to hide inside the bathtub, a "ME" time. Thank you A Happy Mum for giving everyone a chance to have a staycation with family. Definitely looking forward to The Health Club! Hardly have any chance/ time to go to gym due to busy schedules and family commitment. Perhaps its the only opportunity I can have my "ME" time at gym while my hubby and kids sunbathe at their pool! Love the hotel. Always feel very relaxed during my stay there. My young kids will certainly love the swim in kids pool and the fountain while I guess for me and my hubby will certainly be getting our rest in the spacious cozy luxurious room enjoying every bit of amenities in the room is simple but yet fulfilling with the hectic daily activities at home. Of course the Line Buffet certainly also be one that we will love to enjoy with the wide spread of food which really spoilt us for our choices. Hope to spoil my family for a staycation at this lovely hotel!! I look forward to swimming with the kids, exploring the koi pond and landscaped garden. Spending quality bonding time and engaging the activities together as a family. It will be an awesome staycation. My kids love love love bathtub! They simply love water play regardless in the bathtub, swimming pool or water park. My hub and I will be looking forward to the relaxation and food indulgence while enjoying doing things together as a family. For the kids, it will definitely be water play in bathtub and pool! Thanks for organizing the giveaway. My boy is few months apart from Asher. A staycation would be ideal for our family of 4, and my toddler would be so looking forward to Swimming at the pool! 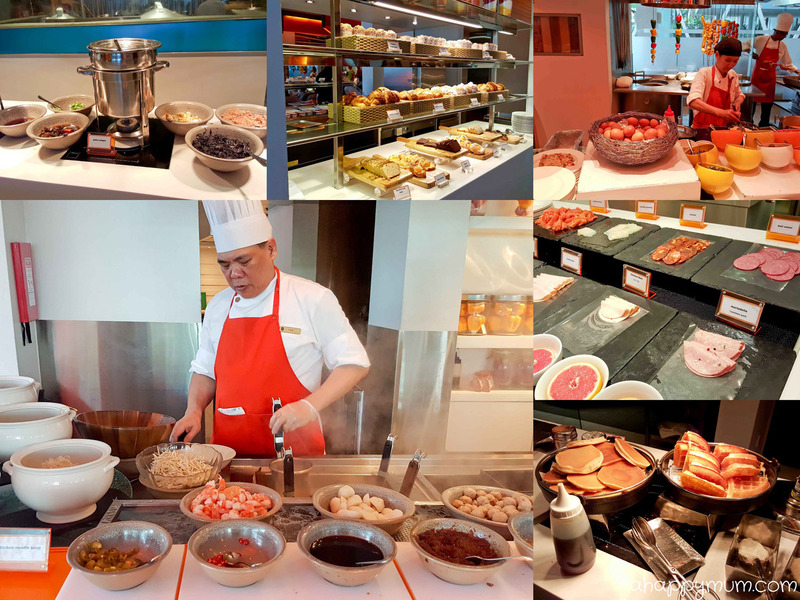 Definitely to enjoy the sumptuous wholesome breakfast buffet at The Line which is always the one of the buffet restaurants in Singapore that I wanted to check out. Great breakfast makes great day! The food pictures make me drool!!! I'm so going to indulge in The Line breakfast and my kiddos are so hitting into the fountain pool! Indulge in the delicious-looking breaj\kfast spread and chill out with the kids at the pool. The swimming pool and eating buffet there! I am so looking forward to a hearty breakfast at The Line after a good night's rest in Shangri-la! I would love to go for Swimming in their beautiful pool with my kids! Looking forward to a sumptuous breakfast at the Line, the relation time at the pool and of cos the time we get to spend and bond with one another... especially with our 3 sons! Definitely the beautiful pool for the children and the delicious food at Shang! we stayed in the same room type we got married at Shangri-la 10 years ago. Yes, 10th wedding anniversary! It will be wonderful if we can bring the kids back to the hotel for staycation and recap on the wonderful memories. They will be thrilled with the Swimming pool and the buffet spread. I love to win to enjoy the good food with beautiful landscaping and of course the luxury of a 5 start hotel. I'm looking forward to the complimentary hotel lounge for the spread of delectable cakes and savouries. Especially so when my hubby is a foodie and both my kids have sweet tooth. I personally would like to sink into the ginormous bed that seems to be beckoning at me. Yes... I'm a sleep deprived mom. Which mum isn't? Since we don't own a car, money went to saving for their school fees, a walk down and back will be such a Once in a Lifetime experience , not having to worry about lugging stroller or diaper bag too heavy. Lastly, a late check out would guarantee a good nap for the kids before we kiss the sunset goodbye. Thank you for the giveaway and pardon if I sounded all too mama-rish. The Line !! Haha coz I love food ! My boy loves hotel and swimming pool. Hope I can win for this staycation for him. I'm most looking forward to that ! my boys love staycation and swimming. looking forward to Swimming in the pool with my loved ones! hope to win! My #2 is turning 1 in April, as we will not be having a 1st birthday party, hope to win this staycation and celebrate together with as a family of 4. Let my 2 girls enjoy their favourite activite swimming and daddy could had his favourite buffet at The Line! Hasn't got a chance to visit shangri-la. Hope to win this to stay with my little family with the up coming of the arrival of our princess this month. Just let my two kids go wild at the kid's pool and water fountain play! The Breakfast buffet and the swimming pool! I'm most interested in the landscaped garden, as it seems so much fun and is barely found anywhere else! 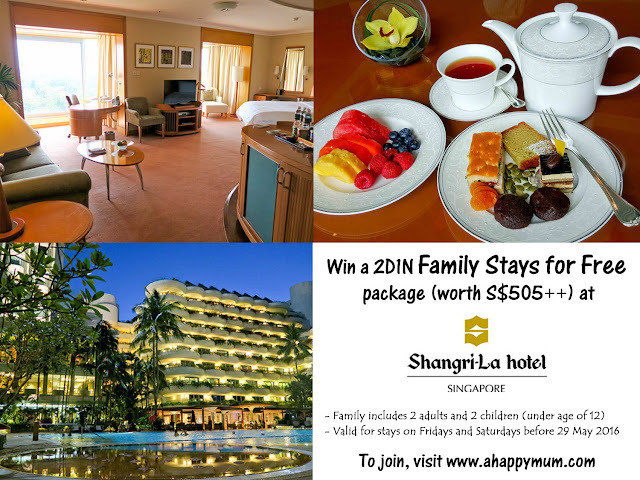 Hope to be the lucky one to win and experience this staycation at Shangri-La with my kids. we love the food at the line! A Staycation will be a rare opportunity for family bonding with the kids since we are both working parents who can hardly spend enough time with the kids..
Would definitely love to show the kids the place where their parents ROM, right beside the Waterfalls. They would love to feed the kois in the pond, have a splash in the big pool and feast at the Line. 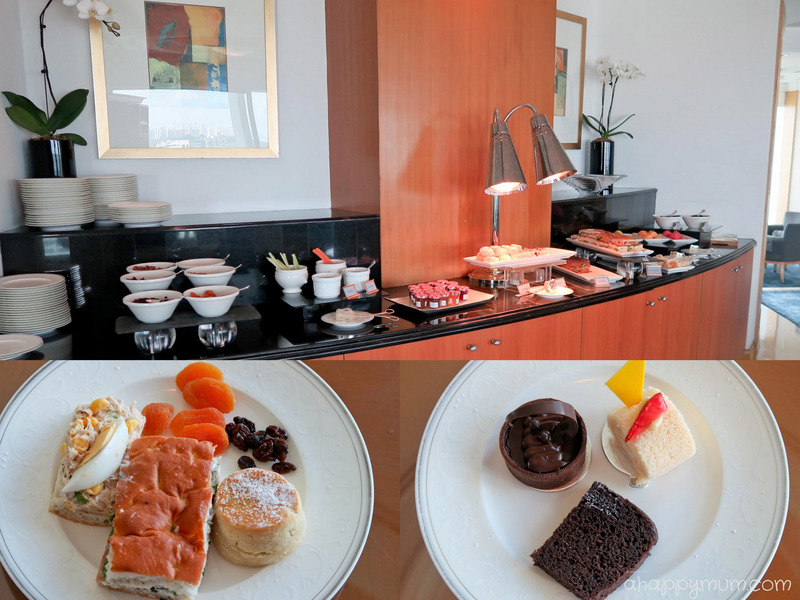 My children will love to splash in the pool and enjoy the yummy breakfast buffet ! Definitely it will be enjoying the breakfast, afternoon tea and evening cocktails at Horizon Club Lounge. I am so in LOVE with the hotel room that is so spacious to accommodate my family of 5. And Im very sure that they will love the room, swimming pool(a place that we will be very happy to see) and to enjoy food in such a pretty environment. So it would be a great reward to them to have a hotel stay away from home on this coming holiday. Thanks for arranging this awesome giveaway!! Hope to win this staycation as our family of four had never been to staycation before! Love all the activities u mentioned, especially swimming and food!! I think nothing in the staycation is not worth to look forward to! I would love to indulge in water play at the pool with my kiddos and resting on the deck chairs after our water play while enjoying being sun-kissed ..
Everything about Shangri-La hotel spells welcome and comfort .. everyone would enjoy their stay at Shangri-La hotel .. with their convenient strategic location, clean and cosy rooms complete with items to pamper and soothe oneself, facilities that allow one to get close and in touch with nature, their wide spread and variety of food to satisfy everyone's appetite .. what's not to love ..
We are a foodie family therefore looking forward to the buffet breakfast at the Line and afternoon tea and evening cocktail at the Horizon club. Omg, looking at the picture already make me so excited. I hope I can win this opportunity to experience a staycation at Shangri-La Hotel for my birthday on Labour Day with my husband at the same time to celebrate our 3rd wedding anniversary with our lovely pie. I will definitely have a family bubbly bath in the huge bathtub, and I will be the most happiest mum especially on my birthday. You've got a wonderful family there! My family and I loves hotel staycation and never been to this shangri-la. Sounds and look beautiful. Perfect for the kids and it'll be a great belated birthday gift for hubby and early birthday present staycation for my baby boy. My two boys and two girls would be thrilled with excitement. Thank you. I'm definitely, selfishly, looking forward to the buffet. Your picture of the desserts... swoon! Would love to bring my little family there for a short break. Wow u definitely had a wonderful splendid staycation! U have a lovely family! Looking at the pics and ur reviews made me so excited and envious!! Hope to win this staycation so my hubby,my girl and me could enjoy a night staycation!! Ohhh.. the food spread is most appealing and so is the bed! Thibk the little ones will have a ball rolling on it! The pool! We have been wanting to go for a swim as a family. Really wish to win this for a good time to drift away! So looking forward to chilling by the awesome pool from day to night view. So romantic la the night view. My 1.5 years old boy love to swim. My husband training for his triathlon. The pool will by awesome for my humble family of 3! I am most looking forward to en joy the luxury of time with my family indulging into their great spread of wonderful delicious food that makes all of us drools just by looking at it. Hoping to celebrate my anniversary together with my hubby and the kids. It will be our first staycation celebrating the anniversary together with the kids , and definitely is going to be meaningful and yet special. Who says romantic must be just 2 person together? I say, romantic with my kids is the best thing, because thats family love, and whatever we do together, we do together, whatever we are looking forward to, we seek success together! The family will definitely love the waterfall and koi pond as well as soaking in the pool! It is a tough choice between enjoying the fantastic good food at the Line or enjoying the relaxing walk in the landscaped gardens. I guess the food is for me and the walk is for the kids! There's something for everyone! Most looking forward to having a fun splashing time at the swimming pool! Looking to bring my baby for his first swim! And definitely breakfast at the Line. How luxurious! Hubby would be pleased! Early morning swim to work those long-forgotten muscles, have sumptuous breakfast buffet, then chill by the pool till it's time for a massage. My kids will enjoy breakfast and pool time for sure. As long as they happy hubby and I will be. I simply like to lay back in cosy room and relax with family! I will love to just laze around by the pool while the kids play at kids area! I am looking forward to the buffet breakfast at the Line and the big hotel room! Hopefully the entire family can come and enjoy this for my brother's birthday! Will I be boring to say that I'm looking forward to the TV helping with child-sitting my kids? We don't have one at home so watching the TV really is quite the novelty for them. �� And I can soak in the bathtub while they enjoy their time with the blackbox. But another activity that is fun for the family is definitely the pool where there'll be no lack of splashing around and laughter. My girl will love to explorethe kids pool & the greenery. Looking forward for spending some quality time together with my husband & my girl. Checking out the CHI Spa to get revitalised while the kids can have fun in the pool. Definitely spending time at the pool w my daughter n feasting at the buffet line! With the hectic life we're leading, it's not often that we can all stop to smell the roses. 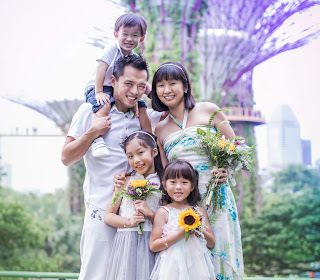 Hence will definitely take a leisurely walk around the Garden Wing, Koi Pond & Waterfall with the family to appreciate nature. I would look forward to enjoying my me-time in that luxurious bath tub while the husband have a whale of a time swimming with the daughter in the pool. I am looking forward to having the sumptuous buffet breakfast and dive or laze by the pool with my wife and kids! I'm looking forward to not doing any housework and be served for once instead of serving! I'm sure it's swimming for my kids though. I'm so looking forward to enjoying cocktails and canapés at The Horizon Club Lounge. With the view and refreshments, it'll be a great way to chillax and have some me-time as a busy working mom. Haha. I love staycation with club benefits. 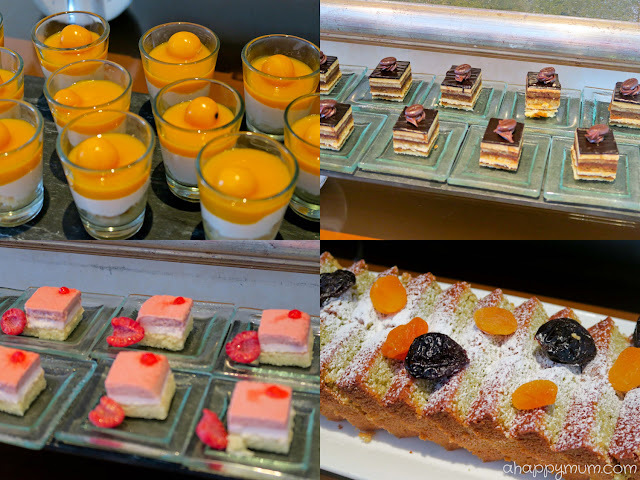 I am most looking forward to having high tea at The Horizon Club Lounge! Just thinking of it alone makes me feel relax and wonderful. I'm most looking forward to have delicious meals at The Horizon Club Lounge. Hope to win my first staycation in Singapore with my family, my boy definitely love the pool & we love the sumptuous spread breakfast. The place to enjoy in Shangri La will be their pool and breakfast buffet line. The pool because its the place to enjoy the natural vitamin D and fun with my children age 1.5 and 4 years. 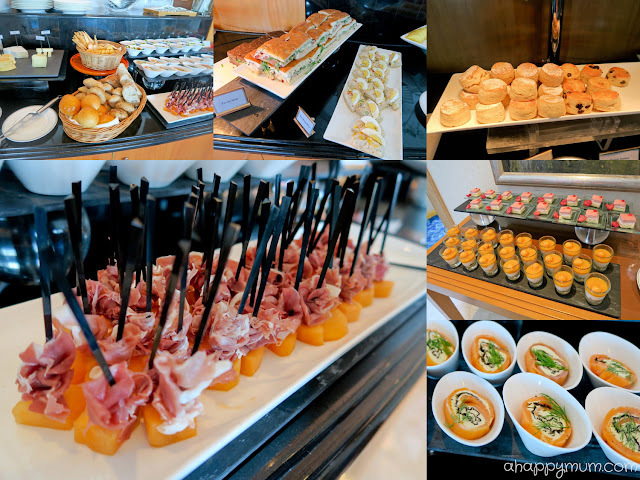 The breakfast buffet at The Line definitely is a must for Singaporean who loves food. Of course, I am hoping to win this staycation as I am expecting #3 where I hope to spend a "babymoon" before the transition to family of 5. Definitely the pool where my son is learning how to swim now. My hubby is teaching him now. He will defnitely enjoy himself at this awesome pool and with an awesome view. 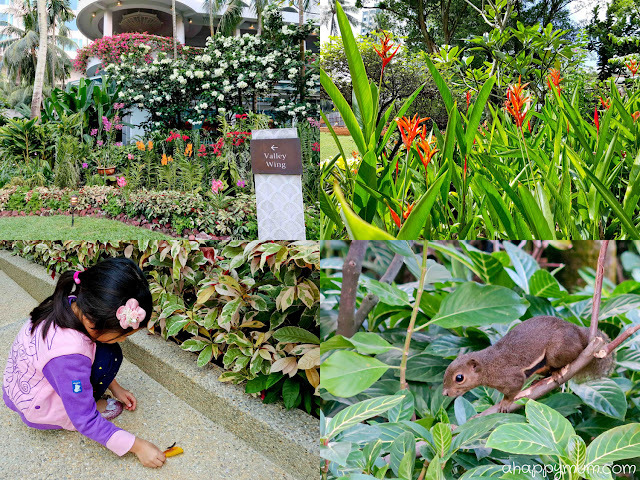 My most favorite activity would be to walk through the landscape gardens, as you mentioned that your kids love spotting squirrels, actually so do I! Getting in touch with the nature makes us embrace what we have currently, and to appreciate it! Love everything about this staycation but favourite will be just spending quality time with family at the pool and a nice surprise for my hubby who will be celebrating his birthday soon. I have been working really hard & stress with my work & studies, I'm looking forward most to relax in the Tower Wing's Horizon Grand Premier Room & eating the delicious breakfast. staycation is good for bonding with family members + swimming in the pool is a good form of exercise. My kids will sure LOVE the Swimming pool. They will love to have their birthday stay there too. I am looking forward to everything, especially relaxing in the huge room, exploring the landscape gardens and breakfast. We love to eat, so yes, the wide variety of food! And would really like forward to time spent just lazing around in the fabulous room, watching TV and just chatting with my family! Not to mention going the amazing food we can have! Would definitely like to win this stay for parents and enjoy the complimentary breakfast at the Line. They'll love it for sure! I'm looking forward to bring my girls to the swimming pool n enjoy the foods.. I am definitely looking forward to chilling out at the luxurious and spacious room and enjoying the complimentary breakfast at the Line. My kids love it for sure! Honestly, there are just so much things that we can do as a family. But 2 activities is especially dear to us as its the kids favourite too! 1 is swimming at the pool and the other is eating...the buffet pictures are just too appealing! I hope to take a slow stroll in the landscaped gardens with my wife. Hopefully, we can spot the squirrels and enjoy the nature and luxuriant greenery. Corporate world is complex and it can be stressful at times. This amazing getaway will be a perfect present to the lucky winner. Thanks Summer for her inspiring stories and heartfelt blog about her lovely children. I would love to plunge into the inviting pool and indulge in the great variety of yummilicious food at THE LINE!! I'm so looking forward to win this awesome stay-cation with my loved ones. After reading the blog story, I'm so eagle & awaiting for this great opportunity to explore the hotel & wanna tried out their yummy buffet treats. My children will definitely love it so much especially the pool. It's so wonderful for A Happy Mum to shared with me. I'm so looking forward to the the yummy food at The Line and my little gal will love the pool! My 2 little cuties will fall in love with the swimming pool! !